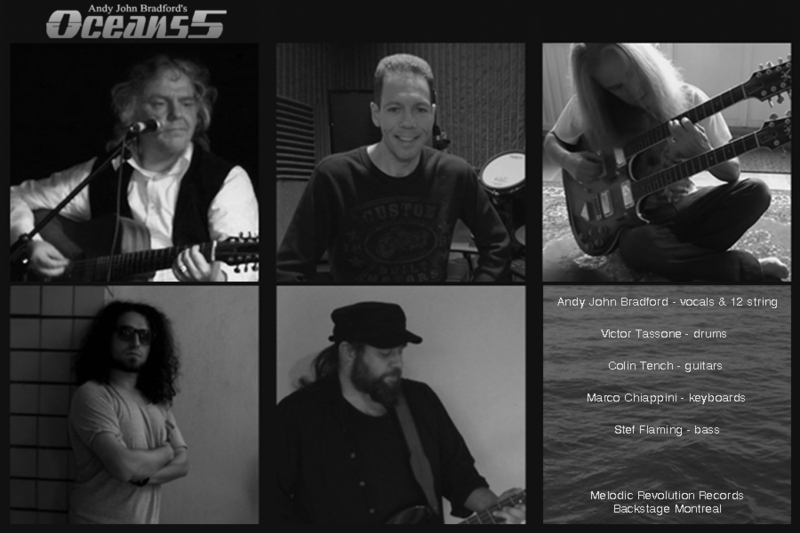 Andy John bradford’s Oceans 5 and the Mingulay Boatsong: when you think of Progressive music, you tend not to imagine a 200 year old traditional tune with sea shanty lyrics. However, “prog” is exactly what Folk Singer/Songwriter Andy John Bradford had in mind when he approached guitarist Colin Tench, with The Mingulay Boatsong. They assembled an unlikely band, purely to record this one song. They produced a version unlike any version of The Mingulay boatsong heard before. They cared not if anybody actually wanted to hear such a version. This lineup clearly had great chemistry and despite the fact that theywere all busy with their own bands, all agreed that this band has something to say. Andy has a great feel for songwriting and Oceans 5 have proved to be rather good at twisting those songs into a whole new form. From bouncy sing-along to slightly epic rock. The first album “Return to Mingulay” could be considered a progressive/folk rock album in that good old fashioned crossover style. Nothing too clever, just oceans of melodies, a duck and fun, with a lot of content for those who listen out for it. The playing does not get in the way of the songs. There are 5 core members in Oceans 5 and although they are all influenced by progressive music, all have very different approaches to composition and style. That combination has resulted in songs that really don’t sound like anyone else. The music owes more to the “anything goes” 1970s than the finely tuned precision of 2013. There are clearly echoes of The Strawbs, Pink Floyd and even Thin Lizzy here. Music should never be a perfect science. It should be a conversation with many opinions, unrestricted by language or bias. From the outset, Sonia Mota (known for her artwork with Corvus Stone), encouraged Oceans 5 and started producing ideas for an album that was still just an idea for Andy and the boys. Like the music, the art is not typical of any particular definition. Maybe Return to Mingulay is a return to freedom to do what you damn well like. There are very special guests on the first album and that will continue in the future. Note about Lorelei McBroom and “6000 friends” Lorelei has that unique ability to sing “Great gig in the sky”, as heard by anyone who witnessed Pink Floyd live on stage from 1989, or own the “Live in Venice” DVD. All that emotion can be heard on the single “6000 friends”. PINK FLOYD’S LORELEI MCBROOM JOINS OCEANS 5 AS LEAD VOCAL IN THE POWERFUL NEW SONG “6000 FRIENDS”! It was obvious to Oceans 5 very early on that 6000 friends was a great song. Andy Bradford wrote this for 2 singers. They wanted someone who could inject power, emotion and imagination. They wanted THE “Great gig in the sky” lady! They found her: *Lorelei McBroom*! Just ask David Gilmour! Lorelei is on tour with The Australian Pink Floyd soon, so they were very lucky to get her between engagements. Their brand new album The debut album “Return to Mingulay” could be considered a progressive folk rock album with an old fashioned crossover style. Nothing too clever or extreme just oceans of melodies, there are 5 core members in Oceans 5 and although they are all influenced by progressive music they all have very different approaches to composition and style. This combination has resulted in songs that really don’t sound like something you’ve heard before. The music owes more to the “anything goes” philosophy of the 70s than the finely tuned precision of 2013. There are clearly echoes of The Strawbs, Pink Floyd and even Thin Lizzy here. Side Note: Music should never be a perfect science. It should be a conversation with many opinions, unrestricted by language or bias. The album ‘Return to Mingulay’ has been released digitally on 7th October 2013. It is available in our store (Special offer! ), and on Amazon and iTunes. Visit Lorelei and learn more about this wonderful artist and what she is doing in music right now.